This post continues discussion about using the evolving WebPush feature. One of the problems with offering a service that doesn’t require identification is that it’s hard to know who’s responsible for something. For instance, if a consumer is having problems, or not using the service correctly, it is a challenge to contact them. One option is to require strong identification to use the service, but there are plenty of reasons to not do that, notably privacy. The answer is to have each publisher optionally identify themselves, but how do we prevent everyone from saying that they’re something popular like “CatFacts”? The Voluntary Application Server Identification for Web Push (VAPID) protocol was drafted to try and answer that question. VAPID uses JSON Web Tokens (JWT) to carry identifying information. The core of the VAPID transaction is called a “claim”. A claim is a JSON object containing several common fields. It’s best to explain using an example, so let’s create a claim from a fictional CatFacts service. The “audience” is the destination URL of the push service. The “subscriber” is the primary contact email for this subscription. You’ll note that for this, we’ve used a generic email alias rather than a specific person. This approach allows multiple people to be alerted, or assigning a new person without having to change code. I’ve added spaces and new lines to make things more readable. JWT objects normally strip those out. A JWT object actually has three parts: a standard header, the claim (which we just built), and a signature. The header is very simple and is standard to any VAPID JWT object. If you’re curious, typ is the “type” of object (a “JWT”), and alg is the signing algorithm to use. In our case, we’re using Elliptic Curve Cryptography based on the NIST P-256 curve (or “ES256”). We’ve already discussed what goes in the claim, so now, there’s just the signature. This is where things get complicated. Here’s code to sign the claim using Python 2.7. # may prepend this prefix automatically. # These are our customized claims. #   my_key.to_pem() to a file. # Return the headers we'll use. There’s a little bit of cheating here in that I’m using the “python ecdsa” library and JOSE‘s jws library, but there are similar libraries for other languages. The important bit is that a key pair is created. This key pair should be safely retained for the life of the subscription. In most cases, just the private key can be retained since the public key portion can be easily derived from it. You may want to save both private and public keys since we’re working on a dashboard that will use your public key to let you see info about your feeds. These are the HTTP request headers that you should include in the POST request when you send a message. VAPID uses these headers to identify a subscription. The “Crypto-Key” header may contain many sub-components, separated by a semi-colon (“;”). You can insert the “p256ecdsa” value, which contains the public key, anywhere in that list. This header is also used to relay the encryption key, if you’re sending a push message with data. The JWT is relayed in the “Authorization” header as a “Bearer” token. The server will use the pubic key to check the signature of the JWT and ensure that it’s correct. Again, VAPID is purely optional. You don’t need it if you want to send messages. Including VAPID information will let us contact you if we see a problem. It will also be used for upcoming features such as restricted subscriptions, which will help minimize issues if the endpoint is ever lost, and the developer dashboard, which will provide you with information about your subscription and some other benefits. We’ll discuss those more when the features becomes available. We’ve also published a few tools that may help you understand and use VAPID. The Web Push Data Test Page (GitHub Repo) can help library authors develop and debug their code by presenting “known good” values. The VAPID verification page (GitHub Repo) is a simpler, “stand alone” version that can test and generate values. As always, your input is welcome. Updated to spell out what VAPID stands for. A few weeks ago, we rolled out a version of the WebPush server that required a HTTP TTL header to be included with each subscription update. A number of publishers reported issues with the sudden change, and we regret not properly notifying all parties. We’re taking steps to solve that problem, including posting here and on Twitter. It’s our hope that this error is descriptive enough to help programmers understand what the error is and how to best resolve it. Of course, we’re always open to suggestions on how we can improve this. Also, please note that we consider this a temporary fix. We prefer to stay as close to the standard as possible, and will eventually require a TTL header for all WebPush notifications. We’re keeping an eye on our error logs and once we see the number of incorrect calls fall below a certain percentage of the overall calls, we’ll announce the end of life of this temporary fix. WebPush is a new service where web applications can receive notification messages from servers. WebPush is available in Firefox 45 and later and will be available in Firefox for Android soon. Since it’s a new technology, the WebPush specification continues to evolve. We’ve been rolling out the new service and we saw that many updates were not reaching their intended audience. Each WebPush message has a TTL (Time To Live), which is the number of seconds that a message may be stored if the user is not immediately available. This value is specified as a TTL: header provided as part of the WebPush message sent to the push server. The original draft of specification stated that if the header is missing, the default TTL is zero (0) seconds. This means if the TTL header was omitted, and the corresponding recipient was not actively connected, the message was immediately discarded. This was probably not obvious to senders since the push server would return a 201 Success status code. Immediately discarding the message if the user is offline is probably not what many developers expect to happen. The working group decided that it was better for the sender to explicitly state the length of time that the message should live. The Push Service may still limit this TTL to it’s own maximum. In any case, the Push Service server would return the actual TTL in the POST response. In this example, the message would be held for up to 60 seconds before either the recipient reconnected, or the message was discarded. The returned error will contain a JSON block that describes what went wrong. Refer to our list of error codes for more detail. We understand that the change to require the TTL header may have not reached everyone, and we apologize about that. We’re going to be “softening” the requirement soon. The server will return a 400 only if the remote client is not immediately connected, otherwise we will accept the WebPush with the usual 201. Please understand that this relaxation of the spec is temporary and we will return to full specification compliance in the near future. We’re starting up a Twitter account, @MozillaWebPush, where we’ll post announcements, status, and other important information related to our implementation of WebPush. We encourage you to follow that account. In response to strong user uptake of Mozilla’s new Sync service powered by Firefox Accounts, earlier this year we announced a plan to transition users off of our legacy Sync infrastructure and onto the new product. With this migration now well under way, it is time to settle the details of a graceful end-of-life for the old service. We will shut down the legacy Sync service on September 30th 2015. We encourage all users of the old service to upgrade to a Firefox Account, which offers a simplified setup process, improved availability and reliability, and the possibility of recovering your data even if you lose all of your devices. Users on Firefox 37 or later are currently being offered a guided migration process to make the experience as seamless as possible. Users on older versions of Firefox will see a warning notice and will be able to upgrade manually. Users running their own Sync server, or using a Sync service hosted by someone other than Mozilla, will not be affected by this change. Update: shutdown of the legacy Sync service has been completed. Users who are yet to migrate off the service will be offered the guided upgrade experience until Firefox 44. Firefox 44 and later will automatically and silently disconnect from legacy Sync. We are committed to making this transition as smooth as possible for Firefox users. If you have any questions, comments or concerns, don’t hesitate to reach out to us on sync-dev@mozilla.org or in #sync on Mozilla IRC. What will happen on September 30th 2015? After September 30th, we will decommission the hardware hosting the legacy Sync service and discard all data stored therein. The corresponding DNS names will be redirected to static error pages, to ensure that appropriate messaging is provided for users who have yet to upgrade to the new service. What’s the hurry? Can’t you just leave it running in maintenance mode? Unfortunately not. While we want to ensure as little disruption as possible for our users, the legacy Sync service is hosted on aging hardware in a physical data-center and incurs significant operational costs. Maintaining the service beyond September 30th would be prohibitively expensive for Mozilla. What about Extended Support Release (ESR)? Users on the ESR channel have support for Firefox Accounts and the new Sync service as of Firefox 38. Previous ESR versions reach end-of-life in early August and we encourage all users to upgrade to the latest version. Will my data be automatically migrated to the new servers? No, the strong encryption used by both Sync systems means that we cannot automatically migrate your data on the server. Once you complete your account upgrade, Firefox will re-upload your data to the new system (so if you have a lot of bookmarks, you may want to ensure you’re on a reliable network connection). Are there security considerations when upgrading to the new system? Both the new and old Sync systems provide industry-leading security for your data: client-side end-to-end encryption of all synced data, using a key known only to you. In legacy Sync this was achieved by using a complicated pairing flow to transfer the encryption key between devices. With Firefox Accounts we have replaced this with a key securely derived from your account password. Pick a strong password and you can remain confident that your synced data will only be seen by you. Does Mozilla use my synced data to market to me, or sell this data to third parties? Is the new Sync system compatible with Firefox’s master password feature? Yes. There was a limitation in previous versions of Firefox that prevented Sync from working when a master password was enabled, but this has since been resolved. Sync is fully compatible with the master password feature in the latest version of Firefox. What if I am running a custom or self-hosted Sync server? This transition affects only the default Mozilla-hosted servers. If you are using a custom or self-hosted server setup, Sync should continue to work uninterrupted and you will not be prompted to upgrade. However, the legacy Sync protocol code inside Firefox is no longer maintained, and we plan to begin its removal in 2016. You should consider migrating your server infrastructure to use the new protocols; see below. Can I self-host the new system? Yes, either by hosting just the storage servers or by running a full Firefox Accounts stack. We welcome feedback and contributions on making this process easier. What if I’m using a different browser (e.g. SeaMonkey, Pale Moon, …)? Your browser vendor may already provide alternate hosting. If not, you should consider hosting your own server to ensure uninterrupted functionality. Last week, we signed an agreement with Combain AB, a Swedish company dedicated to accurate global positioning through wireless and cell tower signals. The agreement lets Mozilla use Combain’s service as a fallback for Mozilla Location Service. Additionally, we’re exchanging data from our stumbling efforts to improve the overall quality of our databases. We’re excited about both parts of this deal. Having the ability to fall back to another provider in situations where we feel that our data set is too sparse to provide an acceptable location gives Mozilla Location Service users some extra confidence in the values provided by the service. We have also extended the terms of our deal with Google to use the Google Location Service on Firefox products, giving us excellent location tools across our product line. Exchanging data helps us build out our database. Ultimately, we want this database to be available to the community, allowing companies such as Combain to focus on their algorithmic analysis, service guarantees and improvements to geolocation without having to deal with the initial barrier of gathering the data. We believe this data should be a public resource and are building it up with that goal in mind. Exchange programs such as the one we’ve engaged in with Combain help us get closer to the goal of comprehensive coverage while allowing us to do preliminary testing of our data exchange process with privacy-respecting partners. We’ve got a long way to go to build out our map and all of Mozilla Location Service, and we hope to announce more data exchange agreements like this in the future. You can watch our progress (fair warning – you can lose a lot of time poking at that map!) and contribute to our efforts by enabling geolocation stumbling in the Firefox for Android browser. Let’s map the world! At Mozilla, we recently had to implement the Hawk authentication scheme for a number of projects, and we came up creating two libraries to ease integration into Pyramid and Node.js apps. But maybe you don’t know Hawk? Hawk is a relatively new technology, crafted by one of the original OAuth specification authors, that intends to replace the 2-legged OAuth authentication scheme using a simpler approach. It is an authentication scheme for HTTP, built around HMAC digests of requests and responses. Every authenticated client request has an Authorization header containing a MAC (Message Authentication Code) and some additional metadata, then each server response to authenticated requests contains a Server-Authorization header thatauthenticates the response, so the client is sure it comes from the right server. To sign the requests, a client needs to retrieve a token id and a token key from the server. The excellent team behind Firefox Accounts put together a scheme to do that, if you are not interested in the details, jump directly to the next section. When your server application needs to send you the credentials, it will return it inside a specific Hawk-Session-Token header. This token can be derived to split this string in two values (hawk id and hawk key) that you will use to sign your next requests. deriving the credentials, not an actual URL. Then, the key material you’ll get out of the HKDF need to be separated into two parts, the first 32 hex caracters are the hawk id, and the next 32 ones are the hawk key. API, built around the python requests library. Luckily, HTTPie allows you to plug different authentication schemes for it, so we created a wrapper around mohawk to add hawk support to the requests lib. Alternatively, if you don’t have the token id and key, you can pass the hawk session token presented earlier and the lib will take care of the derivation for you. If you’re writing pyramid applications, you’ll be happy to learn that Ryan Kelly put together a library that makes Hawk work as an Authentication provider for them. I’m shocked how simple it is to use it. The get_hawk_id function is a function that takes a request and a tokenid and returns a tuple of (token_id, token_key) . How you want to store the tokens and retrieve them is up to you. The default implementation (e.g. if you don’t pass a decode_hawk_id function) decodes the key from the token itself, using a master secret on the server (so you don’t need to store anything). We had to implement Hawk authentication for two node.js projects and finally came up factorizing everything in a library for express, named express-hawkauth. If you pass the createSession parameter, all non-authenticated requests will create a new hawk session and return it with the response, in the Hawk-Session-Token header. If you want to only check a valid hawk session exists (without creating a new one), just create a middleware which doesn’t have any createSession parameter defined. As a reference, here is how we’re using the libraries I’m talking about, in case that helps you to integrate with your projects. It’s also interesting to note that Kumar put together hawkrest, for the django rest framework. It has been almost a year since the release of Firefox Accounts and the new Firefox Sync service, and the response from users has been very positive. The simplified setup process has made it easier to get started with the system, to connect new devices, and to recover data if a device is lost — all of which has lead to the new system quickly gathering more active daily users than its predecessor. During this time we have kept the legacy Sync infrastructure in place and working as usual, so that users who had set up Sync on older versions of Firefox would not be disrupted. As we begin 2015 with renewed focus on delivering cloud-based services that support the Mozilla mission, it’s time to help transition these users to the new Sync system and to Firefox Accounts. Users on legacy Sync will be prompted to upgrade to a Firefox Account beginning with Firefox 37, scheduled for release in early April. There is a guided UI to make the experience as seamless as possible, and once complete the upgrade will be automatically and securely propagated to all connected devices. Users on older versions of Firefox will see a warning notice and will be able to upgrade manually. The legacy Sync servers will remain available during this time to help ensure a smooth transition. We will monitor their ongoing use and decide on a timeline for decommissioning the hardware based on the success of our transition strategy. We’re looking forward to introducing more users to the improved Sync system, and to rolling out more services for your Firefox Account in 2015. Don’t hesitate to reach us on sync-dev@mozilla.org or in #sync on IRC with any questions or comments. When will the legacy Sync servers be switched off? We expect to decommission this infrastructure before the end of 2015, but no firm date has been set. This decision will be based on ongoing monitoring of its use and the success of our transition strategy. Users on the ESR channel will start seeing the upgrade prompts in Firefox 38, which is scheduled for release in early May. We are committed to maintaining the legacy sync infrastructure until previous ESR versions reach end-of-life on August 4. No, the strong encryption used by both Sync systems means that we cannot automatically migrate your data on the server. Once the account upgrade process is complete, Firefox will re-upload your data to the new system (so if you have a lot of bookmarks, you may want to ensure you’re on a reliable network connection). Both the new and old Sync systems provide industry-leading security for your data: end-to-end encryption of all synced data, using a key known only to you. Although we have no plans or timeline for doing so, it’s likely that support for the legacy Sync protocol will be entirely removed from Firefox at some point in the future. You should consider migrating your server infrastructure to use the new protocols; see below. You should consider hosting your own server to ensure uninterrupted functionality. In the last year the Firefox Marketplace migrated from Persona to Firefox Accounts. This was done for a couple of reasons, perhaps the biggest being that Firefox OS was switching to Firefox Accounts. On a Firefox OS phone, you will log in once, to the phone and then be automatically logged into the Marketplace. Firefox Accounts has two different ways to login, a native flow in Firefox OS and an OAuth based flow for Desktop and Android clients. The number of dependencies to complete all that quickly grew out of control, so we focused on the first milestone of ensuring that an OAuth flow worked for all users on all devices. Migration from a database point of view wasn’t too complicated at first. We store the users email from Persona, all we had to was look at the users email from Firefox Accounts … if a user already existed with that account then they logged in as that account. If not we created a new account. The unverified emails were a problem to us, because it meant that a user or developer could have an email address that wasn’t routable, accessible or in any way usable. When they migrated to Firefox Accounts an email would be sent to that old email address and they were stuck. We really couldn’t see any around this other than manually verifying accounts as best as possible and moving them over as needed. For users that already had a Firefox Account through sync and wanted to re-use that on the Marketplace, the Firefox Accounts team added the ability to use a pre-verified token. 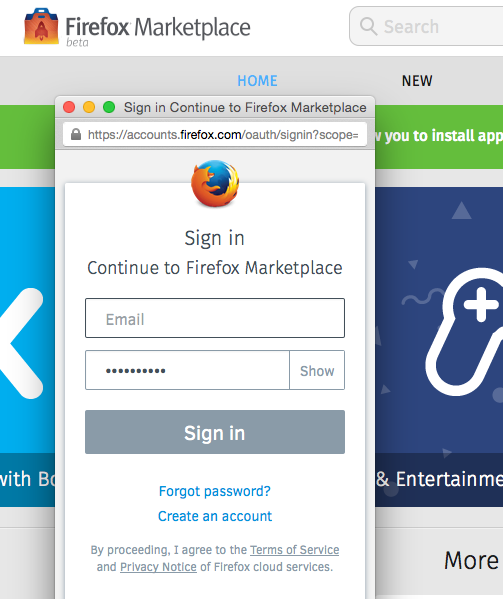 This allowed a user to start the registration flow as a user, but in the Firefox Accounts sign up use a different email address. At the end of the flow the Marketplace would then detect the difference in the email address, but know which account the flow came from and hook it up correctly. Of course the road was not that smooth as the bug list will probably reveal. The biggest difference to any other Firefox Accounts implementors is that the OAuth flow is not the same as the Persona flow. An obvious statement, we thought we had covered until we hit elements like the Trusted UI – at that point it got complicated. Once deployed we sent out an email to everyone and waited for the users to come in. Sure enough they did and we saw a large number of transitions within 48 hours. During this process we made sure emails came out with an email address that could be replied to, I was then able to follow up personally with anyone who had any issues. We also logged login attempts and when we found a bug, I was able to email those people while we fixed and deployed the bug – there were only two people who had a problem at that step, but it felt good to be able to help them. Firefox Accounts has now been active for over 3 months and this week we turned off the special transition flow and deleted the transition flow as felt enough users and developers had migrated. Big thanks to the Marketplace team who implemented this and the Firefox Accounts team who did an awful lot of work helping us out.